Precision screwdrivers. Handles are nickel-plated steel, ribbed for positive handling. Blades of ground, tempered steel. Heads are free-swiveling. Replaceable blades are held firmly in place by special chucks. Complete screwdrivers are sold as a full set or separately. 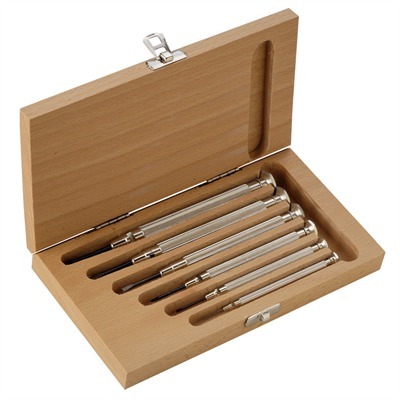 SPECS: Kit contains one of each size (.04", .06", .07", .09", .115", & .140") in a hinged hardwood case.